Fortnightly dev builds available from GOG. 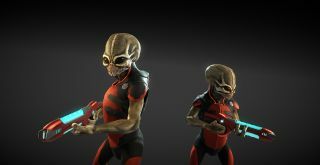 Xenonauts creator Goldhawk Interactive loves that hyphen in the original X-COM so much that it's shoved one into the title of Xenonauts-2, the studio's in-development follow-up to its 2D take on the X-COM formula, which Ian Birnbaum enjoyed back in 2014. We've not heard much about Xenonauts-2 since its official announcement at around this time last year, but we do know that a) it'll be in 3D, and b) it'll be coming to Steam Early Access further down the line. What if I told you that you could play it right now though? And without having to sneak into Goldhawk HQ and nick one of its computers? Well you can, because the developer has released an early demo over on GOG. You'll need GOG's Galaxy client to play the (currently one mission) demo, and it'll be deleted when Goldhawk launches the paid alpha, so you won't be getting access to the final game. As RPS reports, the developer actually quietly released the first public demo back in December, but it's now looking to get more people testing the game. This early demo version of Xenonauts-2 is now on a fortnightly release schedule, with the next update expected on February 28.